When will be Lawman next episode air date? Is Lawman renewed or cancelled? Where to countdown Lawman air dates? Is Lawman worth watching? And the gun of the Lawman. By the code of the Lawman. And he's known as the Lawman. Set in Laramie, Wyoming circa 1880, Lawman was one of several television westerns produced by Warner Brothers in the late fifties. 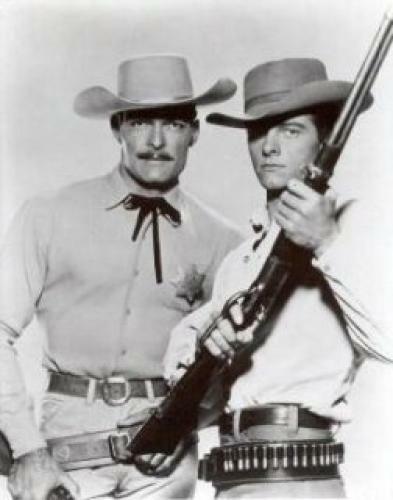 The show distinguished itself in the western genre with its depiction of the relationship between Marshal Dan Troop and his youthful deputy Johnny McKay. Promos for the series described Troop as a lawman of "strength and purpose" and Johnny McKay as "the boy he trained to fight by his side." Handsome, 37 year old, 6'4" former Marine John Russell played Marshal Dan Troop while 22 year old teen heartthrob Peter Brown played deputy Johnny McKay. The mentor/protege relationship between Marshal Troop and Deputy McKay was the heart of the show and what lifted it above the typical tv westerns of the period. Three women were introduced over the course of the series' run as love interests for Marshal Troop. Bek Nelson appeared in the premiere episode as Dru Lemp, the widow of the town's fomer Marshal. The pale and uninteresting Dru managed a Laramie cafe but disappeared mid-way through the first season. She was replaced by the prickly, no nonsense Julie Tate, editor of the Laramie Free Press. Julie was played by starlet Barbara Lang. The character was ousted from the series in the second season by Lily Merrill, proprietress of the Bird Cage Saloon. Played by Peggy Castle, Lily was the most successful of the love interests. None of the women worked out as long term partners for Troop however -- perhaps because the show's 30 minute format was too brief to sustain a romantic thread or because the Marshal's relationship with his deputy was the emotional center of the series and consequently could brook no competition. Celebrity guest stars included Ed "Kookie" Byrnes, Lee Van Cleef, Jack Elam, James Coburn, Doug McClure, James Drury, Joel Grey, Doodles Weaver, Slim Pickens, Troy Donahue, J. Pat O'Malley, Tommy Rettig, and countless others. The black and white, half-hour show ran for four seasons, debuting on October 5, 1958 and ending its run on October 2, 1962. Lawman broadcast 156 episodes with 39 episodes per season. The show generated cap guns, air rifles, western boots, comic books, and other items for boys. Souvenirs, autographs, and photographs are currently available through tv/movie/entertainment memorabilia dealers and at auction on the Internet. Reruns of Lawman may be viewed on some television channels; check your television listings. EpisoDate.com is your TV show guide to Countdown Lawman Episode Air Dates and to stay in touch with Lawman next episode Air Date and your others favorite TV Shows. Add the shows you like to a "Watchlist" and let the site take it from there.